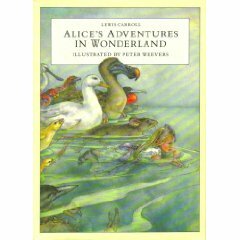 Alices’s Adventures in Wonderland, Lewis Carroll: illustrated by Peter Weevers. Published by Ted Smart, 1996. First published 1989 by Random House. I think this book suffers a bit from the common problem that many of the paintings are too similar to the Tenniels- it must be so hard seeing such familiar mental images in a new way. Having said that, there are an awful lot of them (100), and they’re certainly beautiful. The Alice was based on the artist’s daughter, Tilia. This one was a present- Thanks Jon!